Please note that all PurplePoker management decisions are final. If we experience a server crash or unscheduled downtime of less than 20 minutes, we will attempt to restart tournaments as soon as the majority of players have reconnected. If the downtime lasts longer than 20 minutes we reserve the right to cancel tournaments and refund players based on our tournament cancelation policy. In the unlikely event that PurplePoker has to cancel a scheduled tournament we will make all possible efforts to refund players as fairly as possible. The following represent how players will be compensated for the various tournament phases. If a tournament is cancelled prior to starting, all players will receive a refund of their full tournament registration payments. Tournament buy-ins will be refunded in the exact manner that they were paid. If a tournament is cancelled before the lowest prize level, we will compensate all remaining players based on their play up to the time of the cancellation. (Any player who was eliminated prior to the cancelation will not be entitled to a refund). All remaining players will first receive a refund of their buy-in and entry fee. Then, we will award 50% of the balance of the prize pool to all remaining players and the other 50% of this prize pool balance will be awarded proportionately based on each player’s chip count. If the cancelled tournament has a guaranteed prize pool, only the entry pool will be returned (not the guaranteed prize). If a tournament is canceled and there are players in the money, we will compensate all remaining players based on their play up to the time of the cancellation. (Any player who was eliminated prior to the cancelation will not be entitled to a refund). All remaining players will first receive a refund of their buy-in and entry fee. Then, we will award each remaining player with the minimum prize not yet awarded, and the rest of the prize pool will be awarded proportionately based on each players chip count. If the cancelled tournament has a guaranteed prize pool, only the entry fee will be returned (not the guaranteed prize). However, should you legitimately be disconnected during a hand, the software will put you all-in for all the chips you have already contributed to the pot. All-ins are limited per tourney. Should you time-out (fail to play in the required amount of time) while you still have a connection, you will not be put all-in, but your cards will be folded. When Re-buys end, you will generally be allowed to add-on. Add-ons and re-buys are tournament specific, so check the tournament details to get the information for the Re-buys and Add-ons (R/A) for that particular tournament. Re-Buys and Add-ons add directly to the prize pool. Since this is the case, they can be done only if there is no prize given. Once a player is knocked out in a place that receives a prize, all re-buys and add-ons will no longer be allowed. If a player is not at his seat within the first 5 minutes of play, he is removed. It is the player’s responsibility to be at his seat at game start time. All tournaments start 5 minutes after the close of registration. The tournament is played until one player has all the chips. The Blinds increase according to this blind structure. When only two players are remaining in Hold’em or Omaha poker tournaments, the small blind has the button and acts first before the flop. A bet and three raises are permitted in structured tournaments. There are no raise caps in pot-limit or no limit tournaments. As players are eliminated from the tournament, the software moves players to balance the tables. When ten players are left, the players will be combined onto a single table. If two players are knocked out at the same time, the player with the higher chip count before the hand started will be placed higher. If both players have the same amount of chips, the prize will be divided equally. There will be one 5-minute break every hour. In single tournaments there will be a 3-minute break every hour. Please see the Disconnection Policy in the event of an unforeseen tournament stoppage. PurplePoker Management decisions are final. Rebuys are usually during the 1st hour of the tournament. After the first hour, no rebuys are allowed. You can rebuy anytime your chips are equal or below your starting chips. Rebuys can be found by clicking on the dealer’s tray. If add-ons are permitted, they are added during the first break. Re-buys are the same amount as your original starting chips. Multi Table tournaments are generally online poker tournaments that are multi-tiered and therefore have players playing at several tables and competing to arrive at the final table. Multi-table Tournaments begin at a scheduled start time. 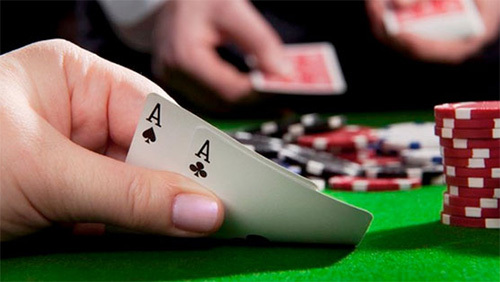 These poker tournaments have a registration period when you ought to sign up in order to play. You should register at least five minutes prior to the poker tournament is scheduled to start. Timed registration tournaments won’t begin on time if the minimum numbers of mandatory players don’t register by the closing of registration. In multi-table tournaments, Poker players initiate with same amount of chips and when your chips gets over, you are eliminated from the game. MTT’s begin with multiple tables and as participants get eliminated tables are combined to keep them equally balanced. The blinds are arranged in a manner that they augment in increments of time. No Limit Texas Holdem is the most well-liked variant of poker played in the MTT set-up. Payout of MTT’s is based on the number of players participating but normally the top 10% are prized unless and until it is a special event. MTT’s are by and large used poker tournament platform in sonline poker rooms. A. Re-buy feature is applicable for online poker tournaments on Purple Poker which permits a player to re-buy chips in a tournament when their chips go below a threshold with Auto Rebuy and Instant Rebuy option to user. The cost of Re-buy and the chips fixed to the player is usually the same as the tournament buy-in without i) fee (if any) and ii) bounty amount (if pertinent) but can differ from tournament to tournament. As a regulation, all pending re-buy requests would be disregarded automatically once the rebuy time is ended. Q. What is Final Add-On? A. The Final Add-On is a last opportunity given to all particpants to add more chips to their stack. The chips selected for a Final Add-on are normally more than the initial chip stack while the rate of the final add-on is same as the buy-in amount without i) Fees and ii) bounty amount (ifpertinant). The Final Add-On period begins when the re-buy period of the poker tournament ends. The play pauses for a few minutes and all participants are permitted to avail the Final Add-On. As a practice, time given to benefit Final Add-On on Purple Poker differs between 2-4 minutes based on the poker tournament type. In case the participant gets the choice of Add-On and he cancels the pop-up by mistake, he/she then can click on ‘Add-On’ button available till Add-On period. Freeroll tournaments are those online poker tournaments where players can enjoy free poker games. These poker tournaments are structured by online poker rooms to boost potential player database. Players register for freeroll tournaments with no entry fee and have a opportunity to win real money. If you are a novice then freeroll tournaments are really good to gain tournament experience. If you don’t wish to invest any money in an online poker website and seek to play around a bit, then again freerolls are for you. These poker tournaments bestow a lot of free poker games and new players, hence a lot of poker exposure can be received by a beginner player.